The 2018 MATS will feature exhibits from several original equipment manufacturers for a second straight year after all of the major North American truck makers chose to forgo the event in 2016. Kenworth Truck Co., Peterbilt Motors Co. and Mack Trucks Inc. are set to showcase their latest equipment at MATS, held each year at the Kentucky Exposition Center in Louisville, Ky.
Navistar Inc. will have a smaller presence at the show centered on its OnCommand Connection remote diagnostics and technology platform. However, Mack is the only OEM that has scheduled a formal press conference to announce product news. The truck maker, which will bring its new Anthem model to MATS for the first time, will anchor a leaner MATS press conference schedule than in years past. Daimler Trucks North America, the parent of Freightliner and Western Star truck brands and Detroit engines and components, is not participating in MATS. Volvo Trucks North America also is skipping the show. Several large trailer makers are passing on the event as well. Nonetheless, event organizers expect MATS to attract about 75,000 attendees and host more than 1 million square feet of exhibits from over 1,000 companies. 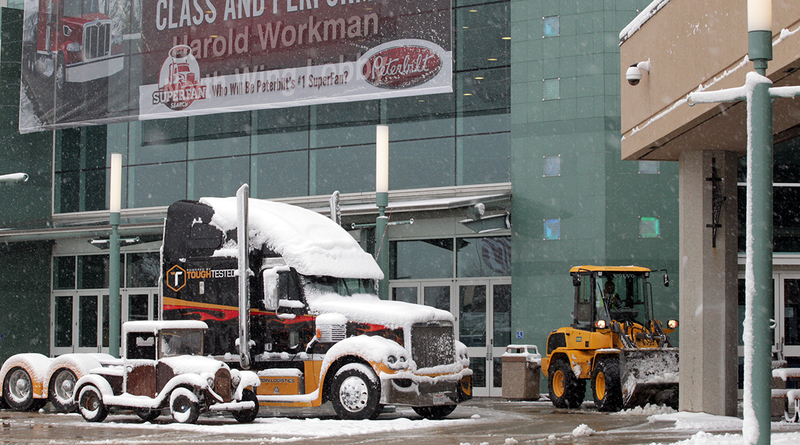 MATS remains the continent’s largest heavy-duty trucking show, but the long-running event now is competing in a more crowded trade-show landscape. The North American Commercial Vehicle Show convened its inaugural event in September. All of the major truck makers except Peterbilt and Kenworth participated in the Atlanta-based show, which organizers plan to hold every other year. While MATS contains many exhibits and sessions geared toward drivers and owner-operators, the smaller NACV has a heavy focus on connecting fleet executives with OEMs and suppliers. The first NACV hosted 439 exhibitors and drew 6,000 visitors, organizers said. The second edition of the event is scheduled for October 2019. MATS, founded in 1972, is holding its 47th show this year. It had 1,012 firms exhibit last year and 72,271 attend, according to show managers. As in years past, MATS will include a slate of educational sessions led by industry experts and government regulators. The Federal Motor Carrier Safety Administration will host seminars on electronic logging devices and hours-of-service enforcement in the ELD era. The federal ELD mandate, which went into effect Dec. 18, requires most longhaul truckers to use ELDs instead of instead of paper logbooks to automatically record their HOS information. The Kentucky State Police also will hold a session on commercial vehicle inspections. Other seminars will address topics such as business management, starting and charging systems on modern trucks, managing diabetes on the road and the federal Compliance, Safety, Accountability program. A day before MATS begins, Mobil Delvac will host its Fleet Maintenance Forum on March 21 at the nearby Omni Louisville Hotel, where industry experts will discuss ways to address the challenge of recruiting and retaining diesel technicians. Country music star and former American Idol contestant Kellie Pickler will headline a free concert for all MATS attendees on March 23. “Every year, the Mobil Delvac Driver Appreciation Concert gives us the chance to spend time with and honor the remarkable men and women who drive today’s trucking industry forward,” said Cassandra Clarke, commercial offer advisor for on-highway vehicles at ExxonMobil, the concert’s sponsor. MATS also will host an awards presentation for the Paul K. Young Truck Beauty championship on March 24.